« Valencia, more than just oranges! End of July I will be going to try out some new hides in Spain. I will fly to Valencia and drive 3 hours west towards Castilla la Mancha. Castilla la Mancha is an autonomous community in Spain and exists out of the following provinces: Albaceta, Ciudad, Guadalajara and Toledo. This region is famous because of the story of the famous Spanish novel Don Quixote by Migual de Cervantes. La Mancha is generally a uniform plain with little relief, highest peak is La Villierca (1600 meters). 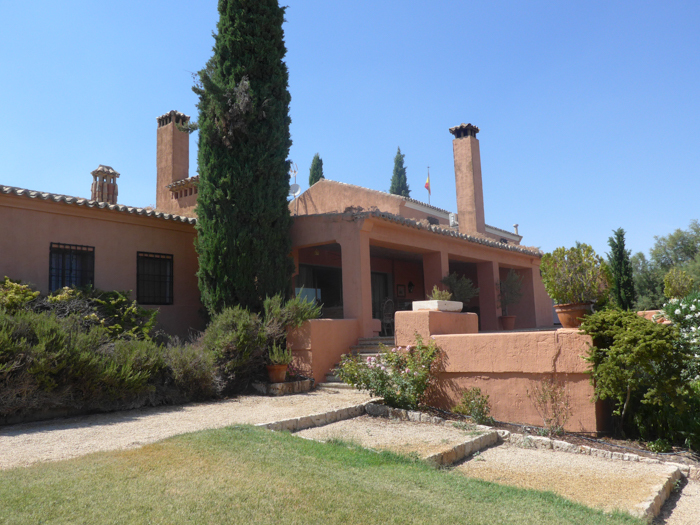 I will be staying near Villafranca de los Caballeros. Close by Villafranca de los Caballeros is a laguna, called Laguna de El Taray. Around the laguna, a number of hides have been erected and here i will spend a week photographing all kind of birds from water birds to smaller birds and raptors. Not all of the hides will be operational as it is already quite late in the season but a number of them should offer really good opportunities to photograph birds like Stone curlew, Marsh Harrier perhaps Sandgrouse, all kind of smaller birds which will come to the drinking pools to drink and bath. Another new adventure will be the aqua hide, a kind of floating island with me in it with my camera and lens! The idea is to walk in 1.5 meters deep water towards any kind of birds that are swimming around. An interesting enterprise! I hope i keep afloat and don’t drop my gear in the water! As stated before, the weather will be extremely hot. When I recently checked the forecast it was 35 degrees plus for most of my stay at El Taray! Needless to say: i will be photographing from very early in the morning till around 11.00 in the morning and from late afternoon till dusk. I will also venture out at night as the area around the hacienda is very good for Nightjar, that can be easily approached and warm themselves at night on the sandy tracks. 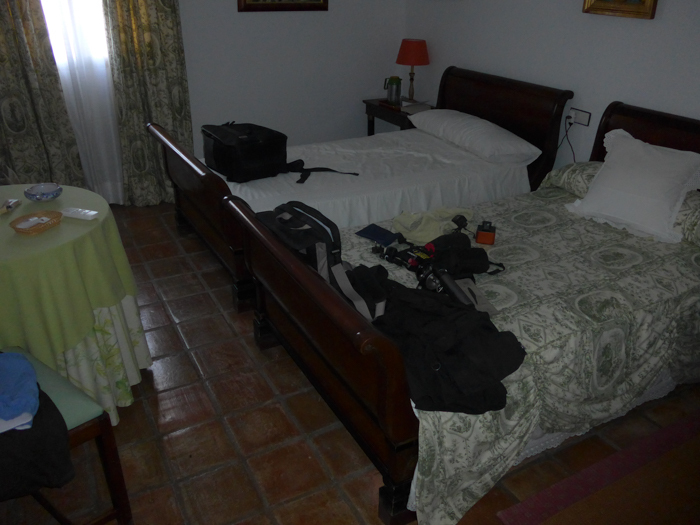 I will be staying at a totally renovated hacienda, which is very close by the various hides. It will make it very easy to get to and from then hides! The hacienda is comfortable, i will have my own apartment. Breakfast, lunch and diner are all taken care of! During the hottest part of the day i can use the swimming pool and i am sure a few beers and glasses of wine will also help to cool me down! The hides are all built to a high specification. As is the norm nowadays: you take your pictures through spy glass. It generally works well, albeit you lose 2/3 stop of light and photographing under an angle can cause unsharpness. I have had good experiences with hides built with glass so I have no reason to be concerned. The Laguna is shallow with a maximum depth of 1.5 meters, it should not be too much of a problem moving around in the Aqua hide. Birds that you can photograph this way are: waders like Black-Winged Stilt and the first migratory waders like Green Sandpiper and Common Sandpiper, Eared grebes , Ducks and various Tern species. It will be an interesting exercise and ! must say; i am a little bit nervous about! I hope to be able to update my diary on a daily basis and I hope you will take the time to check in from time to time to see how I am getting on! All intro pictures courtesy Luis Frechilla and Camilo Oriol. The usual early departure. I arrived at Gatwick North terminal around 07.00 and the flight left on time. I could have flown via Madrid but prefer Valencia as the airport is much smaller and actually next to the motorway. The distance from Valencia to El Taray is around 180 miles, from Madrid around 75 miles. I picked up my rental car from Enterprise and was pleasantly surprised that i was given a free upgrade to a brand new Opel Zafira. I arrived at Villafranca de los Caballeros around 16.00 The roads are very quiet in this part of Spain. The sat nav didn’t help to get me to El Taray from Villafranca and i decided to park up next to the graveyard and call the estate: 30 minutes later Francisco pulled up in his 4 wheel drive. Google translate would become my best friend during my stay at El Taray! A short drive, followed by a 3 mile dirt track and i arrived at El Taray. What a gorgeous estate! Surrounded by a shallow lake, bushes and olive trees. I met up with Inma who would be taken care of the catering for me. My room was lovely which would make my stay very comfortable. El Taray is not a hotel. It is a privately owned estate and it was great that i was allowed to stay on the premises. Normally guests who visit the estate, stay in a hotel in Villafranca and drive up and down the road to visit the estate and the hides. 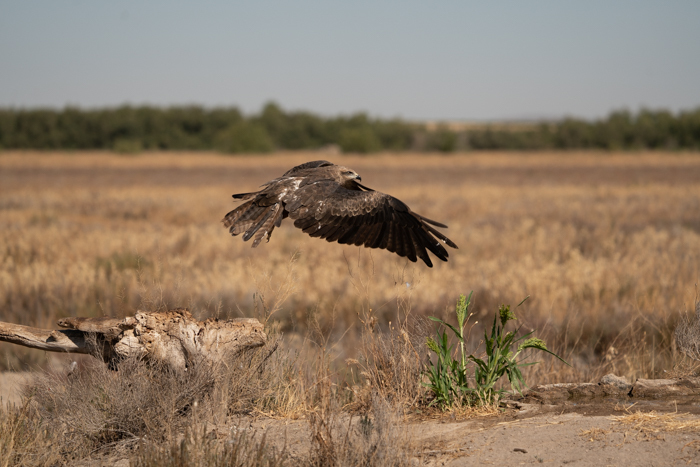 There are around 20 hides on El Taray and give ample opportunities to photography birds like : Stone curlew, Spanish sparrow, Lesser kestrels, Harriers, Black kite, Common buzzard, Sandgrouse and many others. Hydro hides are available as well! 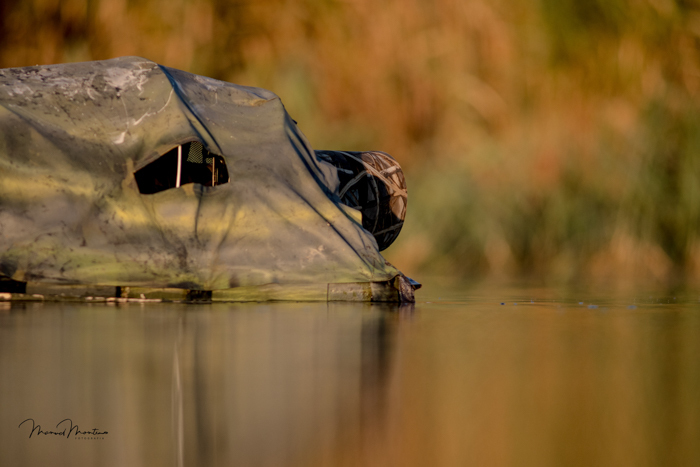 These floating hides will get you close and on eye levels with waterfowl, like Grebes, Flamingos and ducks. The lake itself is shallow with a depth of 1 to 2 meters. This year the water levels were even lower as it hasn’t rained for a while. After a cold Cerveza, Francisco, with the help of Google translate, explained the program. As i was late in the season, some birds had already left for Africa (Lesser kestrel) so it would be best to concentrate on the hides that were productive. I totally agreed. The light is pretty harsh during the day, so my routine for the week was to get up at 6, out by 7 till around 10-11 o’clock. Back to the Finca for a rest and a swim (there is a pool), diner mid afternoon, out again by 1800 till around 21.00 followed by another late diner. I can tell you that the food was fantastic and so was the White wine and Cerveza’s! I spent a few hours in one of the Stone curlew hides that evening but unfortunately not many birds showed up bar Spotless starling, Turtle dove and a few Larks. Around sunset Francisco picked me up and drove me back to the house. I had a lovely diner in a splendid dining room overlooking the lake through panoramic windows. Black ibis and a large flock of Flamingo’s were resting in the shallow water. It is a lovely house in a fantastic location. Late that evening i went to bed. Tomorrow would be the first full day! Up at 6, a quick breakfast and by 7 I was on the road with Francisco. All the hides are close by and the furthest hide is 10 minutes away. The estate is vast. In Spain are around 500 different bird species and around half of them have been seen and photographed at El Taray. This morning I would try a hide for Stone curlew. This strange wader is a shy bird. During the day hiding, blending in with its surroundings. Early morning and in the evening the birds visit the drinking pools. You can often hear them but seeing them is far more difficult. The hides are built to a high standard. 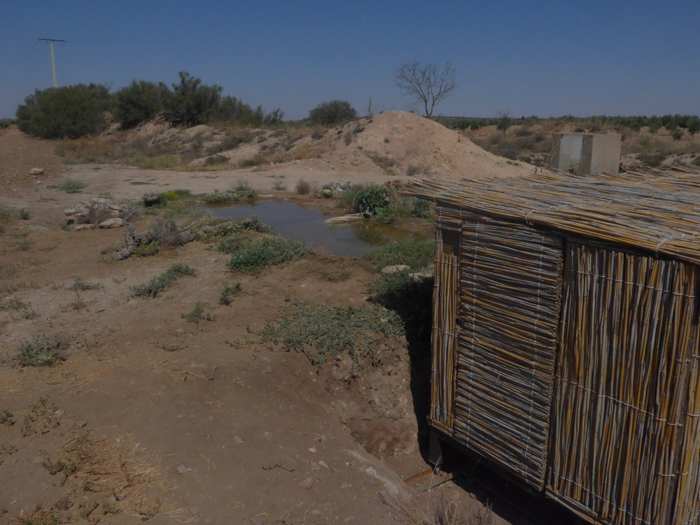 This particular hide is built on a rail system. 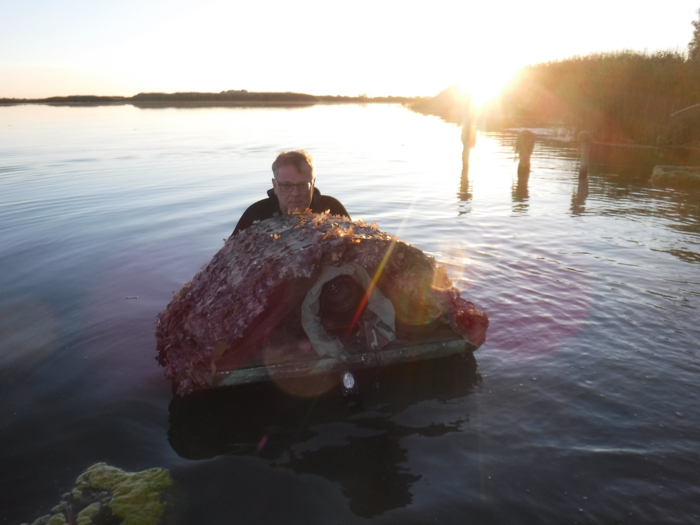 In the morning you will have the sun coming from behind and if you use the hide in the evening, they can move it and turn it 180 degrees, so you have the evening sun coming from behind! I can see Sandgrouse flying over, as well as a Great Bustard. A few rabbits come to drink and a large number of Tree and House sparrows are constantly drinking and bathing. I take some nice images of a Spanish sparrow and all of a sudden a Common sandpiper stops by. Clearly migration has started already. I would see many more in days to come. All of a sudden I spot some movement away from the hide. Stone curlew! Slowly the birds approach the hide. Stopping regularly, checking out the area. Eventually I am able to get some really nice images of these great looking birds in the early morning light. Lovely birds with large yellow eyes and a nice plumage. They come and go a number of times but eventually decide that it’s enough and they disappear. Never flying, always walking away from the drinking pool! Francisco picks me and a Spanish photographer up around 11 and we return to the finca. Here I meet Camilo Oriol. Camilo is the owner of the El Taray. He inherited the estate from his father. He is an excellent photographer and is a man with a vision. He wants to built the best hides in Spain and tells me he will show me around the hides under construction that afternoon. After lunch we visit a couple of the new hides. Especially the Sandgrouse hides are fantastic. Built into the ground you will be photographing the birds from ground level. Another hide, under construction, is for European cranes that come to the estate in the Autumn. 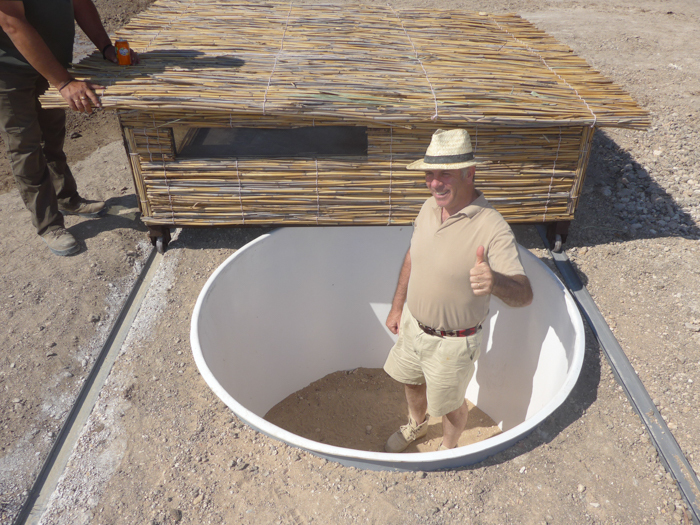 The hide will even include sleeping accommodation. As I said earlier: the hides are really excellent and a lot of thought has gone into the design. That evening I would have my first Hydro hide session. Rather apprehensive I must say but Camilo tells me that there is nothing to worry about and Manolo, the instructor, will be coming and stay for a few days to “swim” with me. At the lake I put on my neoprene diving suit and Manolo explains how to peddle and operate the hide. This evening there is a lot of wind, which makes it difficult to move around. The camera and lens are mounted on a gimbal head. Your arms are resting on either side of the camera and with your legs on the bottom of the lake, you move around. Eventually I get the hang of it and we venture out on the lake. We approach some Gulls and Grebes and I manage to take some pictures but the strong wind makes it difficult to photograph as the Hydro hide moved up and down on the waves. The Flamingo’s are very alert but again i manage to get a few shots. We return back to base but this would become a difficult peddling session for me….on the wind I move forward very slowly and it is rather exhausting and I get some cramp in my legs. All the time Manolo is with me. A great instructor and he is an excellent photographer! Eventually we arrive near our starting point but I can’t stay on my feet when i get from under the hydro hide. Thank god for Manolo! Tomorrow morning early another session. Manolo told me that morning session are the best: no wind, birds are actively feeding and the light in fantastic. This morning another Hydro session and by 07.00 I am in the lake in my neoprene suit. It’s a gorgeous morning: no wind, fantastic light. 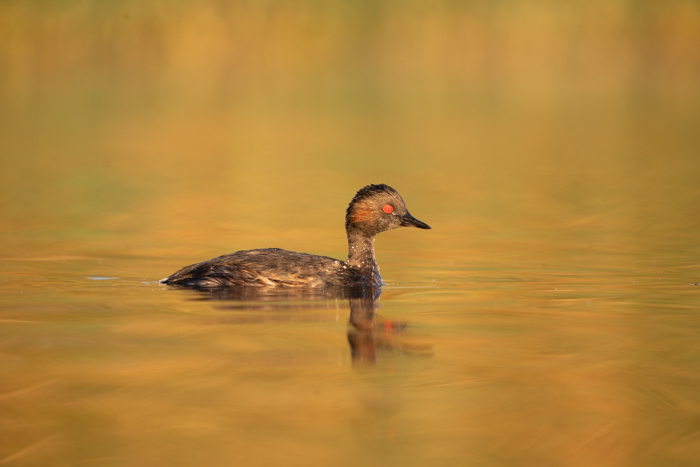 This time we will not go too far as Manolo has spotted a large group of Black-necked grebes feeding with their young. We slowly move towards the birds and it is an amazing experience. I actually don’t have to move around at all! The birds are so close, popping up right in front of my floating hide. I take many images of the Grebes feeding their young, young riding on the back of the parents, Little grebes, Red -crested pochard and Ruddy duck. I stay with the birds for around 2 hours and then i make my way back to the starting point. Far easier then the day before, as there is not wind. I really enjoyed the Hydro hide experience and tomorrow morning I will have a final session in the lake. I return to El Taray for a siesta and lunch. This evening i would go to the Marsh harrier hide. Early evening Francisco drives me to the Marsh harrier hide. The hide is situated near a reed bed and has a grassy area in front of it. Here is where the hide is situated. I put my equipment up and wait for things to happen. After half an hour I see a Marsh harrier flying over, followed by another 2 birds, but they don’t come down and disappear. All of a sudden , from behind the hide, one of the Marsh harrier comes down. It’s a splendid looking male. A bit later followed by an immature bird and eventually a female harrier swoops down as well. That evening the birds come and go and regular intervals. The best action is later that evening, when the birds start to fight among themselves. I take many images. It must have been near sunset that the birds disappear. Another great day has passed by! Back at the estate I have a nice diner with Camilo and we chat away about bird photography and other things. A lovely evening. 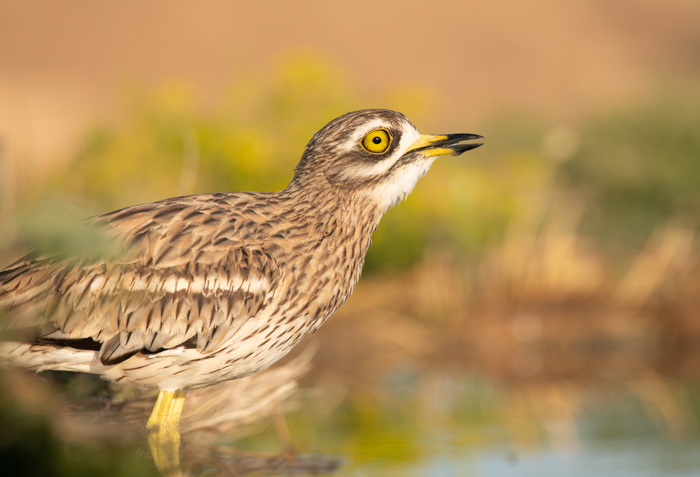 Tomorrow morning the final Hydro session in the morning and in the evening Stone curlew hide. Another beautiful morning and before i know it, i am already floating around in my Hydro hide. Manolo decided to go to the same spot as yesterday and there are even more birds then yesterday. I have never seen so many Black-necked grebes. A lot of interaction between the mature and young birds. Feeding, preening, piggy rides, you name it. This morning, instead of the Nikon D850 with 200-500, i am using the Sony A7RIII with the Sony 100-400. So much more compact and the AF is a bit quicker as well. The light is golden and the lake is like a mirror. I spent another good 2 hours on the lake. A large number of Common sandpipers fly overhead. It was a great session. I can recommend these Hydro session. It is good fun and amazing that you can get so close to the birds. Late May, June and beginning of July will give you even more opportunities on the lake. Manolo will return to Toledo today. A great guy and he knows his stuff! 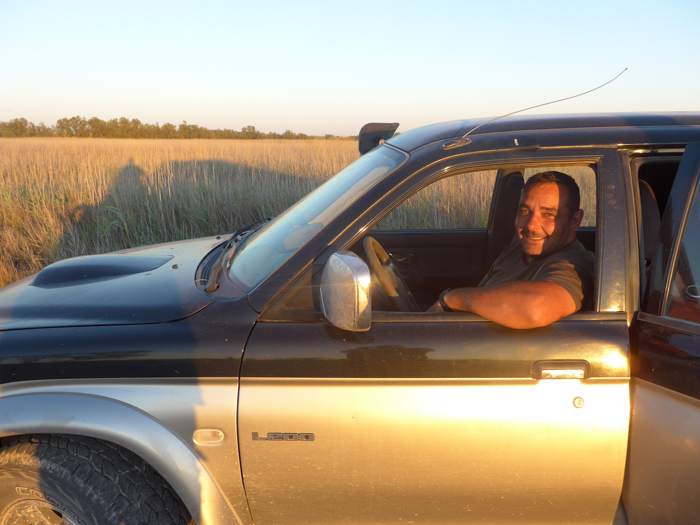 Around 6 that evening Camilo drives me to the Stone curlew hide. This time the hides have been turned 180 degrees (using the train track) and we wait for things to happen. A lot of sparrows are at the hide, Spotless and Common starling, as well as drinking Roller. A big surprise is the arrival of a young Iberian Green woodpecker. Shame it decides to stay in the shade but i still manage to get a number of decent images. The light is fading and still no Stone curlew but eventually I spot one walking towards the drinking pool. Careful as always, checking out the area, going back and forward at times. Eventually the bird arrives, drinks, takes a bath. Another one followed suit. Both birds stay for a while before wandering off. A third bird seems to be very wary. Stays only a very short while and instead of walking it flies off! I love the evening light! We return, have another lovely diner. On that note Inma is a great cook and she takes good care of me. The weather, as can be expected, has been excellent. Hot but from today onwards it will be even hotter. Camilo tells me that spring was very wet but now it has been very dry. So dry that the water levels in the lake are much lower then what they usually are. There is no fish in the lake as well but that will change in time to come. Most birds fish on abundance of newts. This morning i would spend the morning in a raptors hide on a plain. In fact it is one of the hides furthest away from the Finca. I see again Great starts flying and a number of Back kites. I settle down in the hide, waiting for things to come…but there is nothing happening! No bird to be seen and I am getting a bit worried. I know of course birds can come and go as they please but I sure hope something would show up at the hide at some stage! By 9 I see a raptor flying low towards the hide. Black kite! Another 3 Black kites follow. A Marsh harrier and 2 Common buzzard stop by as well! I take many images of the birds and there is a lot of interaction, especially the Buzzards are intolerant of the other raptors and chase them off regularly. It is a fantastic hide, built in a super location. The birds stay till around 11.30. By that time the light is too harsh and Francisco picks me up. Talking about Francisco: he is a great guy. Nothing was too much trouble for him and he would always make sure that I was ok. He has the same enthusiasm as Camilo. I gave him a nick name as well; Alonso. He sure knows how to drive a 4 wheel over dirt tracks! That evening I was going to go back to the Marsh harrier hide and i was in for a treat! The marsh harriers were there but there were also 2 Common buzzard, who started to fight among themselves at first and later on had regular battles with the Marsh harriers! This went on for quite some time and the whole evening the birds were in front of the hide eating or flying around. A great experience again! Around sunset Francisco picked me up and we drove back to the finca. i saw a fox and a Little owl in a tree. There is so much wildlife on El Taray and it is so diverse. There are not many places like this i would think. My last morning in El Taray! Weather superb again. Another session the Black kite hide. For what ever reason activity in this hide always seems to start a bit later. Maybe it has to do with air heating up before the raptors can set off. 2 Ravens arrive, lovely birds and I take many images. Then a Buzzard arrived, followed by another one and before i know it have a total of 9 Raptors and 2 Ravens in front of the hide. All the other raptors are Black kites. Regularly the Buzzards chase off the Black kites. I take some lovely images of the Buzzards drinking and having a bath in the small drinking pool that is situated on a small moat. Slowly the birds disappear and by noon I am on my way back to the house. 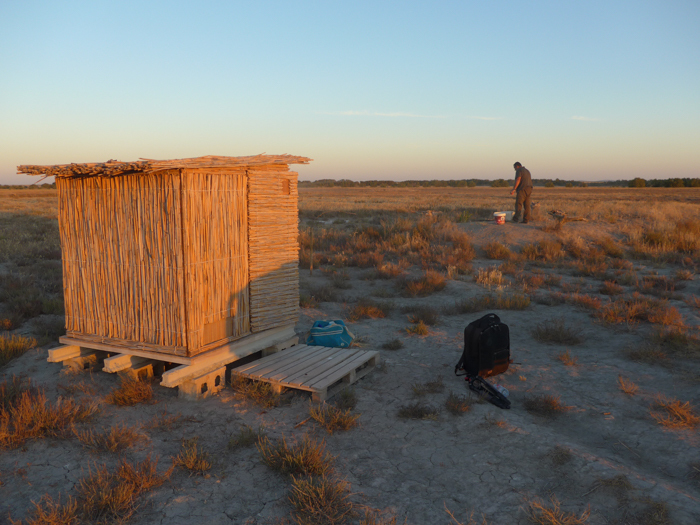 Late afternoon I decided that my last session at El Taray would be in the Stone curlew hide. It is the hottest day so far and i am struggling a bit with the heat. It is very hot in the hide. The usual collection of Sparrows and Starting are there and 3 Rollers come in to drink and have a bath. The Iberian green woodpecker also shows up, as well as a Crested lark. The main attraction are of course the Stone curlews and this evening they come a bit earlier. it has all to do with the heat! They are very thirsty and this evening there are 2 birds. The light is fantastic again and I snap away. Around 21.00 they birds disappear. My last session at El Taray was superb! I return to the house and have my last meal with Camilo. Tomorrow I will leave around 07.00 for my 3 hour drive to Valencia airport. El Taray is a wonderful place to be and i had a fantastic time. Next year will return for sure but will go earlier in the season as more different birds are around and more hides will be operational. Camilo will, for sure, take El Taray to the next level. A big thank you to Inma and Francisco. I was made very welcome and was taken good care off! I flew with Easyjet to Valencia. Cost for return flight was £200. Car rental was with Enterprise and cost was £225 for the week, unlimited mileage. The drive from Valencia to El Taray will take around 3 hours. Roads are quiet. You can also fly to Madrid. In that case it will take you 1 1/2 hour to get to El Taray. 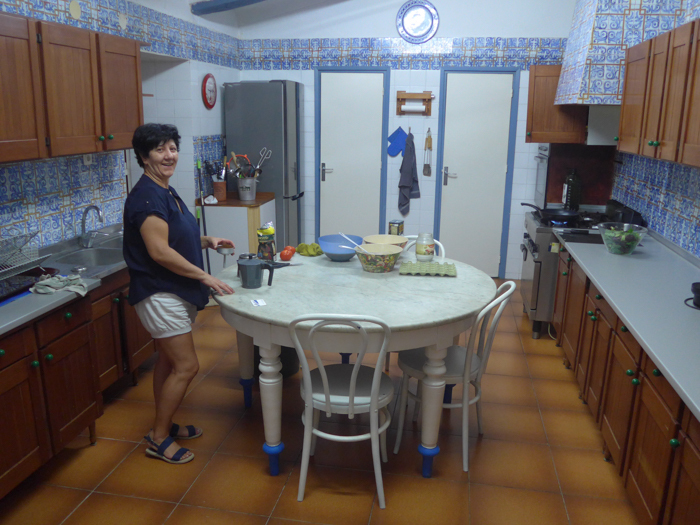 I stayed at the finca but , for now, guests will stay in a local hotel in Villafranca. It is my understanding that eventually El Taray will be able to have guests staying there. Weather was extremely good, hot and sunny all the times. Best time to visit El Taray (in my book) are the months of May, June and early July. The cost for a week stay including transport, hides, accommodation and food was around EURO 1400. If you are interested, please check out Hides de El Taray on Facebook and send Luis Frechilla an email. Luis is very helpful and pro active and will give you any advise on anything related to El Taray. Equipment wise i used Sony A9 and A7R3 bodies with a Sony 100-400 and 70-200 lens with and without converter. I also used a Nikon D850 with a Nikon 200-500 for a bit more reach. So far the estate is mainly visited by Spanish photographers and very little by foreign photographers, this is something that for sure will change in the future as i think El Taray is that good! There is more to La Mancha then just Don Quichote! if you would like any further information or have questions: contact me any time. Happy to help! Great blog again, Rene ! Nice to see how you pick the nice and less known places, always gives me suggestions for our next trip. Am very curious about the pictures you took. Dank je Tom. De moeite waard om daar eens heen te gaan. Ik ga zeker in 2019 weer terug!